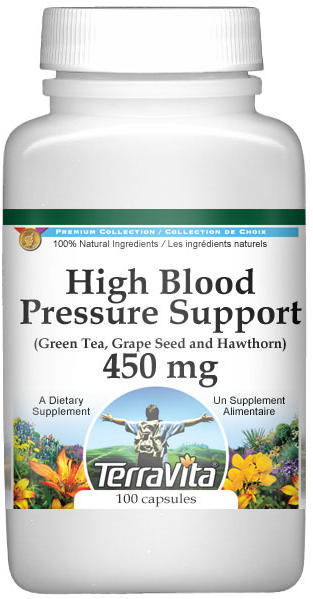 This blend is specially formulated to address high blood pressure and is based on recent scientific findings. In a very recent study published in March of 2006, grape seed extract was shown to help support hypertension. Grape seed extract out-performed the placebo in a study out of the University of California at Davis. Studies also confirm that green tea drinkers are at a 46% lower risk of developing hypertension as opposed to those who don't drink green tea at all. Green tea may also be very beneficial for those recovering from heart attacks as well. Hawthorn berry is an herb that dilates arteries and improves coronary blood flow reducing blood pressure. Some of the flavonoids in hawthorn help fight the narrowing of blood vessels. It also is a mild diuretic that reduces blood volume. Most patients who take hawthorn have a drop in blood pressure of 10 to 15 points over 8 weeks.